I have had a very busy couple of weeks, as I am moving house. I have also had a lot of clients all over the UK, and when travelling to these clients, there was something I noticed. As I was sat on a 2-hour train going to visit a client of mine, I looked up from my computer, and saw that the train was extremely busy. I looked at the people on my train. Every single person was either on their phone, or on their laptop. It didn’t matter what their age or gender was, they were on a piece of technology. This got me thinking. We are in the digital age where we are so attached to our technology, that we don’t notice what is happening around us (most of the time). In the digital age, I am both a consumer, and business. Technology facilitates me in both building my business, and purchasing products/services. I am lucky to have started my business journey into technology as the digital world started to evolve. I evolved with it. All of the above brought me to the conclusion that to have a successful business over the coming years, there has to be a shift within a business, regardless of its size. 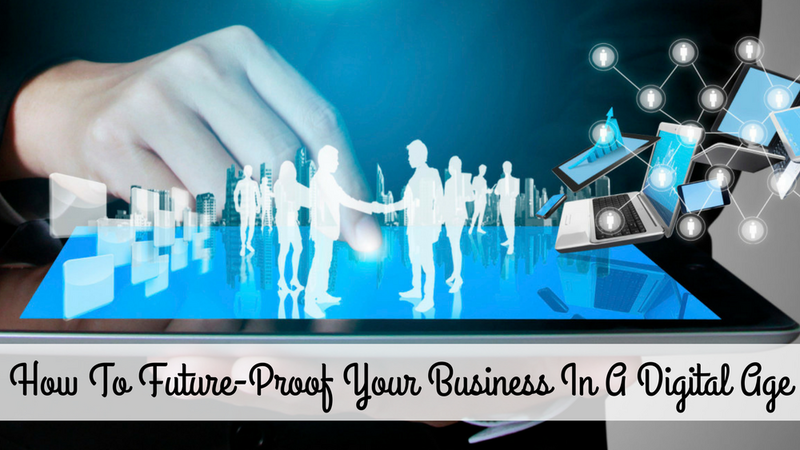 We have to look at how to future-proof your business in the digital age. We know that the digital age is constantly expanding, evolving and growing. I want to share with you some of my thoughts around how you can future-proof your business in a digital age. Generation C is a term used to describe are those who are engrossed in technology. They thrive on the three C’s; connection, community and creation. They are the most engaged online audience and are willing, and ready to search, find and purchase online products/services. The reason why Gen C is so important, is because they are difficult to reach through traditional media. They are the people who are living in a digital age, and are looking for you online. They have influence, and are willing and ready to become brand advocates if you can understand them, and engage with them. If you are looking to future-proof your business in the digital age, technology will be a huge part of this. I’m not talking about the ground-level technology that you use on a day-to-day basis. I’m talking about what you use when creating business processes. New technology is being released daily and you need to future-proof your business and the processes now, so that you are ready for the ever-changing digital age. One of the main building blocks for a successful business in the digital age is transparency. This is more important now, than ever before. Transparency comes in many forms. You need to be open, and honest with your communication online, and with the way you run your business, and the strategies you create. The future of your business is dependant on building a transparent brand online. If you run an online business, you will likely need to adapt the ideology of working remotely. The demand for office space is going to be cut over the next five years. The costs for office space are going to increase as less will be available, and more will be covered into other types of space. Start understanding how best to work remotely now, so that you can prepare for this in the future. Your productivity is key, and understanding how best you can work remotely now, will have a positive impact on the future of your business. 50% of startups that went on to become market leaders in their industry used mobile technology at the heart of their product. Look at Uber. They are primarily app based and yes, they are experiencing a few legal issues but you cannot deny the popularity, influencer and power they have all from a smartphone app. Look at ways in which you can take your business mobile now. We are already in a digital age, and having mobile functionality should already be a given. If you’re still deciding whether this is the right route to take, it 100% is. I have spoken briefly about strategy above. One of the most important things that will change when looking at how to future-proof your business in the digital age. How will going through a digital transformation affect your current business model? How are you going to identify new digital trends in your industry? What problems are you going to face when future-proofing your business? How are you going to position yourself as a thought leader in your industry? I hope that all of the above will help you future-proof your business in a digital age. If you are already going through this process, I would love to find out what changes you have already made. I think a further challenge is how to not get caught up in the constant change, in that you are distracted from your core purpose. Is there a reasonable time frame to lock in on a set of methods, tools, technologies – stick with them and then “revisit” at a moment in time. With all of the advances in technology distraction becomes a key factor that needs management and control. So agree with all you say, we can clearly see that many of the established business which have failed not keeping up with future of technology has meant they are not growing there customers from the younger generation and hence has been part of their failure. Thanks, Kim, and I wish other business owners would embrace this digital revolution sooner rather than later.